Indoor and outdoor spaces are seamlessly connected at Newbridge on the Charles near Boston, MA. A stainless steel Kismet sculpture invites people into the landscape, toward footpaths and flowering perennial beds in the surrounding healing gardens. Sacred spaces have long been a part of human history. Within our modern plugged in society, we tend to overlook the connection between nature and well-being. Hospitals assume the vital task of ministering to us when we are sick or hurt and these institutions are increasingly aware of the important role nature plays in the healing process. Many of them are enlisting artists and landscape architects to design healing gardens which are accessible to staff, patients, and sometimes even the wider community. 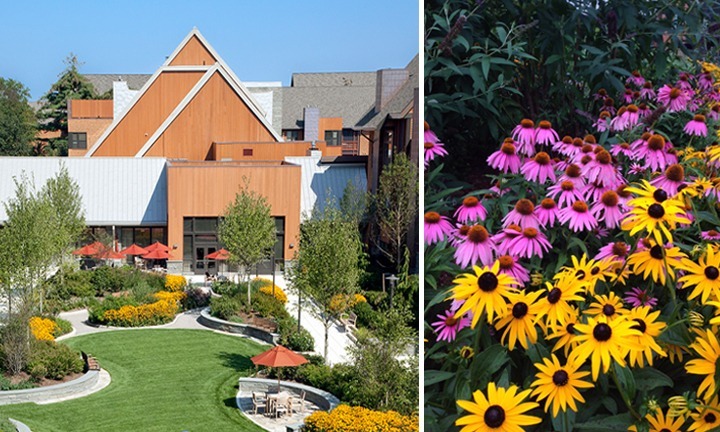 Healing gardens, designed to connect indoors to out, are being integrated in mental health facilities, schools, hospices, and nursing homes, as well as hospitals. Some are pocket gardens cultivated in unused spaces while others are vast swaths of grass that boast walking loops, outdoor stages, and may even be open to the community at large. Access to nature is restorative to all visitors, but is especially therapeutic for patients. Many healing gardens have art integrated into the landscape design. The research of Roger Ulrich, as explained in this Scientific American article, suggests that even small doses of naturescapes can have a healing effect on patients. Snap and Tempest sculptures are featured in The Donna and Senator Percy Malone Healing Gardens at the University of Arkansas Medical Center. Photo by Kelley Cooper/UAMS. We have been honored to have several of our sculptures placed in various healing or therapeutic spaces including the gardens at Ronald McDonald House in Long Beach, CA and Newbridge on the Charles, an innovative assisted-living community near Boston, MA. More recently two of our works were placed in the new Percy Malone Healing Garden at the University of Arkansas Medical Center Psychiatric Research Institute. Contributions by the namesake Malone family and Vic Jacuzzi brought the garden to life. Jacuzzi donated two of our abstract metal sculptures, Snap and Tempest, in honor of his late daughter, Stacey Jacuzzi Antes. The garden is a healing space for those dealing with mental illness. Annie’s Garden, a therapeutic sculpture garden dedicated to beloved nurse Anne Stuart Robinson at Norton Hospital in Louisville, KY. Photo: Luckett & Farley. Another therapeutic garden called Annie’s Healing Garden was recently installed at Norton Hospital in Louisville, KY. This outdoor sanctuary and sculpture garden honors nurse Anne Stuart Robinson who worked at the hospital for thirty years. Friends, family, and co-workers cooperated to bring the healing garden to fruition after Anne lost her battle with cancer in 2014. Terra Sculpture had the great pleasure of providing two modern garden sculptures, Flight and Closer, for the dedicated space designed by Luckett & Farley Architects & Engineers. Annie’s Garden is ADA accessible and designed with colors, patterns, lighting, and focal points that add texture and warmth to the space. 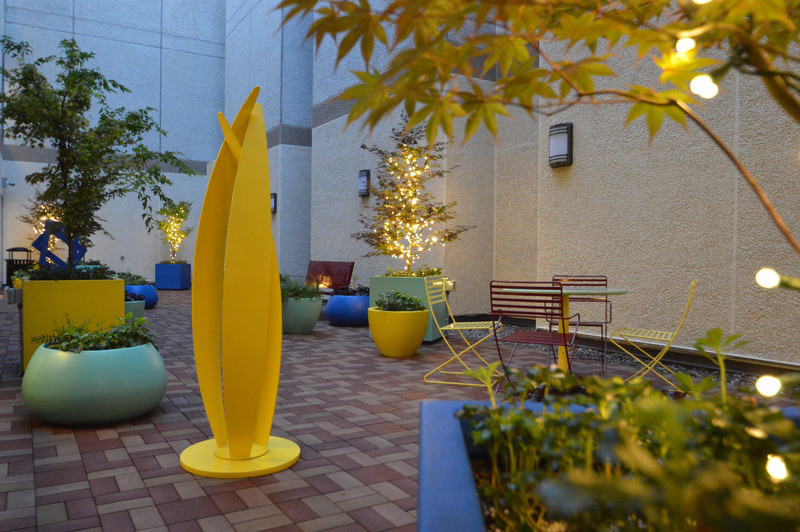 A bright yellow Flight sculpture punctuates Annie’s Garden, a colorful and inviting outdoor space designed to provide a healing environment for patients and the public at Norton Hospital in Louisville, KY. Photo Luckett & Farley. Through mindful design of both the landscape and art, healing gardens can be sacred spaces that nurture the powerful connection between nature and healing. TS: We love this idea of healing gardens in hospitals! What was the mission for Annie’s Angel’s and the hospital in creating this space? KP: Annie’s Healing Garden was created out of the desire to transform an existing 1300 square foot ballasted roof space into an outdoor area of respite for patients, families, and caretakers. The opportunity for patients to momentarily escape the indoor hospital environment and be in an outdoor garden setting is an important part of healing therapy. KP: The reaction has been very positive! The healing garden is named for Anne Stuart Robinson, who was a registered nurse at the hospital for over 30 years. She lost a battle with cancer and the garden serves as a memorial to her great dedication to nursing and Norton Hospital. TS: How did you translate the mission (physically and aesthetically) into the space? KP: With special attention given to patient ease of use, the healing garden is ADA accessible and utilizes a variety of large colorful planters to provide structure and form to the linear space. LED lights strung in Japanese maple trees add a glowing warmth to the space. The plant palette was selected to provide varying color and form throughout the seasons, including evergreen ferns to give texture in the winter. The benches incorporate a grass pattern in the seat back, while table and chair arrangements offer additional flexible seating. A recycled paver flooring system provides the opportunity to incorporate memorial engravings. The space is completed by free standing colorful metal sculptures that provide focal points within the garden.